Happy Friday! I've been working from my sister's house this week, dog sitting and letting her spoil me with her cooking. I've been served chiles rellenos, potsticker soup, lamb orzo, and kimchi fried rice, and I barely lifted a finger for any of it (ok, I made some rice). It's all been cozy and lovely and I haven't even been into Boston once. But I'm kind of ok with that for this trip. But now it's December 1st and I've moved onto panicking about Christmas gifts. I sat out Black Friday and Cyber Monday and Small Business Saturday, so my gift purchasing progress is...none? I need to get a move on. If you, like me, find yourself behind the curve on holiday gifts, or maybe short on moneys to purchase said gifts, the homemade route is never unwelcome, in my experience. And these caramels would make the perfect gift! They are laced with pomegranate molasses to add tartness to the sugar, butter, and cream, for a sour-sweet burst that I love. Bring them for the host of your Holiday parties, your co-workers, your candy-loving relatives, whoever. Pretty much no one ever was sad to receive a homemade caramel. And if you are thinking you can't possibly make something like caramels, let me assure you that this is a dump, stir, and bring to boil situation, and all you really need is a candy thermometer and some patience. Adapted from Smitten Kitchen. I cut the original recipe in half but it can easily be doubled. Get all your ingredients together. You are boiling sugar here so you want to be prepared. Line a straight-sided loaf pan with 2 sheets of parchment draped into a sling and set aside. Stir together cinnamon and salt in a small bowl and set aside. In a pot, stir together butter, molasses, sugars and cream. Set the pot over medium-high heat with a candy thermometer clipped to the side. Let the mixture come to a boil and let cook until it reaches 252 degrees, about 5 minutes. Remove the pot from the heat, remove the candy thermometer, and stir in the salt and cinnamon mixture. Stir well to combine, the pour mixture into the parchment lined pan. Let sit for at least 2 hours at room temperature, until firm. When caramel has set, remove from the pan by lifting up the parchment sling and transfer to a cutting board. Oil a sharp knife and cut the caramel into 1x1 inch squares. 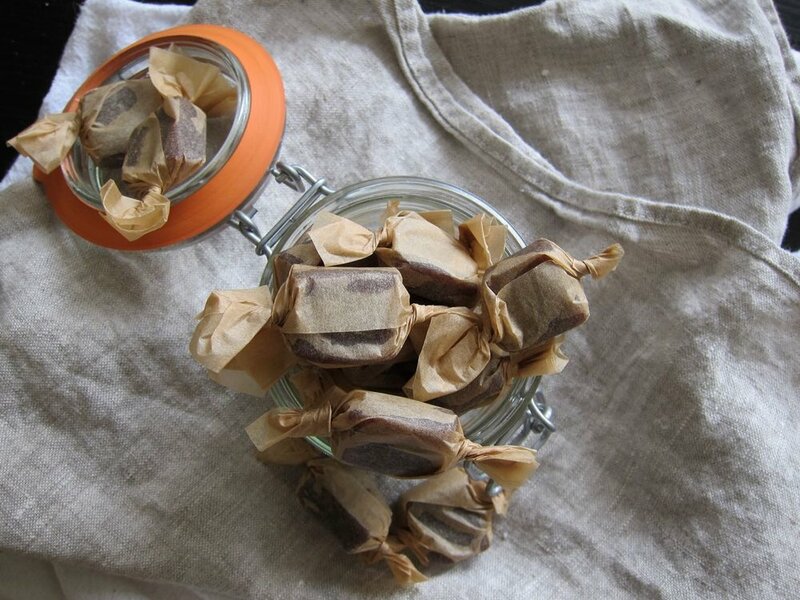 Wrap caramels in wax or parchment paper and store in the refrigerator. They can be kept at room temperature but they will be very soft.